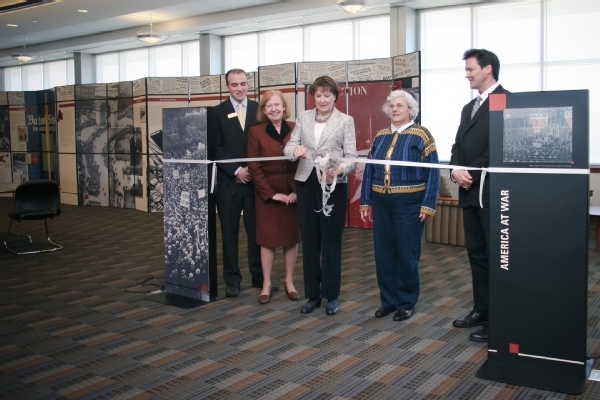 University of North Georgia President Bonita Jacobs cuts the ribbon for the official opening of the traveling exhibition "Fighting the Fires of Hate: America and the Nazi Book Burnings." University of North Georgia President Bonita Jacobs stressed the importance of freedom of expression before cutting the ribbon on Jan. 22 officially opening the traveling exhibition "Fighting the Fires of Hate: America and the Nazi Book Burnings" produced by the United States Holocaust Memorial Museum. The exhibition, which runs through March 15 at the Library Technology Center on the university's Dahlonega campus, and accompanying lecture series are free and open to the public. The exhibit is built around the events of May 10, 1933, when college students across Germany burned books by Sigmund Freud, Albert Einstein, H.G. Wells, Jack London and others. "When we look at freedom of expression, particularly in a university environment, it is important for our students to be able to exchange different ideas and to learn to appreciate the freedom of expression," Jacobs said. "This exhibit is very meaningful and very important to our university, and I ask you to encourage your friends, your students and your neighbors to visit this exhibit." The exhibit features more than 50 panels and five interactive digital stations that feature reproductions of Nazi propaganda and depictions of the works and authors who were targeted as being "Un-German." Also depicted are photographs of German students marching against what they viewed as "Un-German Spirit" and setting bonfires to destroy banned books and literature they had taken from their personal libraries as well as shelves of public, university and fee-based lending libraries. The exhibition and lecture series are supported by a gift from The Friends of North Georgia and is a collaborative project by faculty from UNG and Kennesaw State University and the KSU Museum of History and Holocaust Education. This exhibition was underwritten in part by a grant from The Blanche and Irving Laurie Foundation, with additional support from the Lester Robbins and Sheila Johnson Robbins Traveling and Special Exhibitions Fund, established in 1990. Dr. James Badger, an assistant professor in the College of Education who was instrumental in bringing the exhibition to UNG, spoke briefly about the exhibit at the afternoon event. Internationally known scholar Dr. Deborah Lipstadt, the Dorot Professor of Modern Jewish History and Holocaust Studies at Emory University, presented the keynote address in an evening event in the Hoag Student Center auditorium on the Dahlonega campus on Jan. 22. On Monday, Jan. 28 at 7 p.m. in the Special Collections Room of the Library Technology Center, Sally Levine, the specialist for teacher and curriculum development at the William Breman Jewish Heritage and Holocaust Museum in Atlanta, will speak on "Teaching about the Holocaust: A Workshop for Educators." She also is a museum teacher fellow and regional educator for the United States Holocaust Memorial Museum, located in Washington, D.C.
On Friday, Feb. 8, at 7 p.m., Dr. Laurence Sherr, Kennesaw State University's composer-in-residence and scholar of music and the Holocaust, will present "Banned Music in the Nazi Era," a concert and lecture, in the Gloria Shott Auditorium. This event is made possible through the support of UNG's Department of Performing Arts. On Monday, Feb. 25 at 6 p.m., Dr. Sabine Smith from German studies at Kennesaw State, will explore the issue of "Degenerative Art, Architecture, Film" in the Library Technology Center's Special Collections Room. Dr. Catherine Lewis, director of the Museum of History and Holocaust Education at Kennesaw State and professor of history, will present the closing lecture "Looking Back, Looking Ahead," on Wednesday, March 13 at 6 p.m. in the Library Technology Center's Special Collections Room. Schools and other groups are invited to schedule a Friday tour of the exhibition. Tour reservations are currently being accepted and must be requested at least seven days in advance. To schedule a tour or for more information, contact Ms. Bonnie Morris, bmorris@northgeorgia.edu, or 706-864-1521. To learn more, visit the Book Burning Guide.